I can always count on you to bring a smile to my face..FLORIDA style!! love your friends and there trees..
That all orange juice ad is pretty neat. Our things are still in boxes! Love, love, love the golf cart! That is just the cutest, most hilarious thing I'v ever seen. Your friend is adorable. It is frosty cold here in Maryland and although I don't mind it, I do NOT like the wind! Takes the breath right out of you. Enjoy this holiday season. Oh goodness, that tree is just delightful!! The little Tropicana OJ boxes are so cute and what a novel idea. 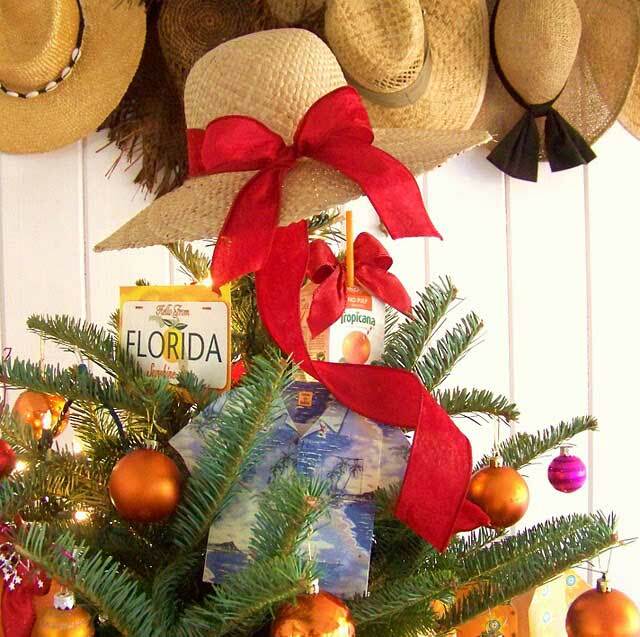 how fun is that florida themed tree...but i don't see any manatees? i think they must be on there somewhere, right? thanks so much for stopping by the cape on the corner, and for your sweet comment on my dining room table vignette. you'd be welcome to come over...but definitely not to snag my goodies! so nice to meet you! 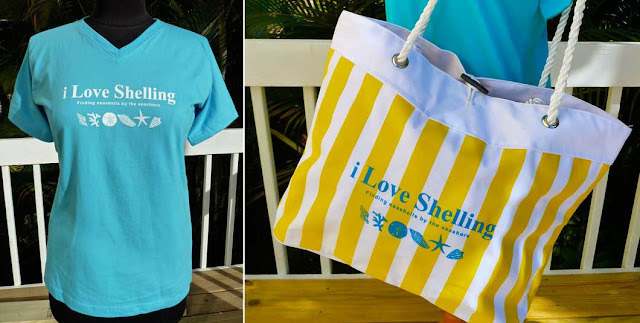 Hey Shell, many thanks for including me in this post! I feel humbled and honored!!! 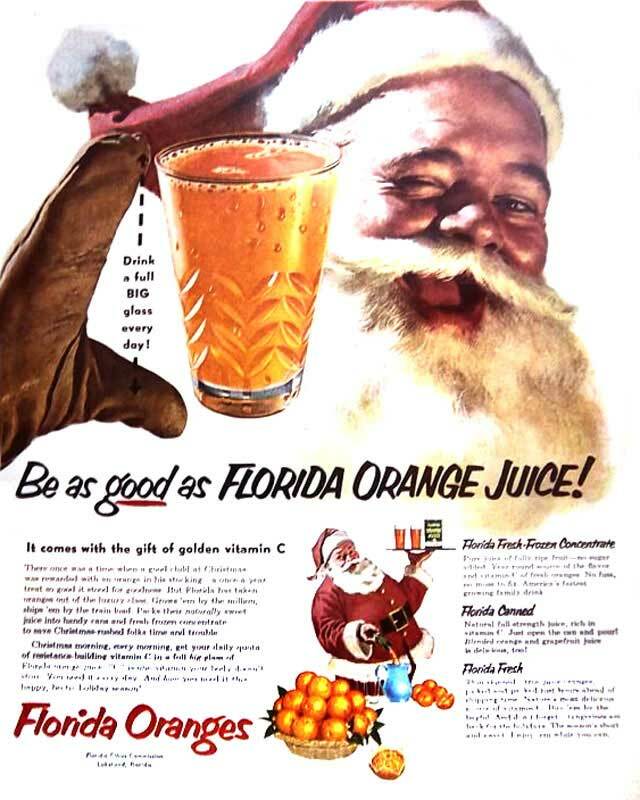 Loved the Santa ad with the orange juice...hilarious! So old Florida, eh? Love old Florida! 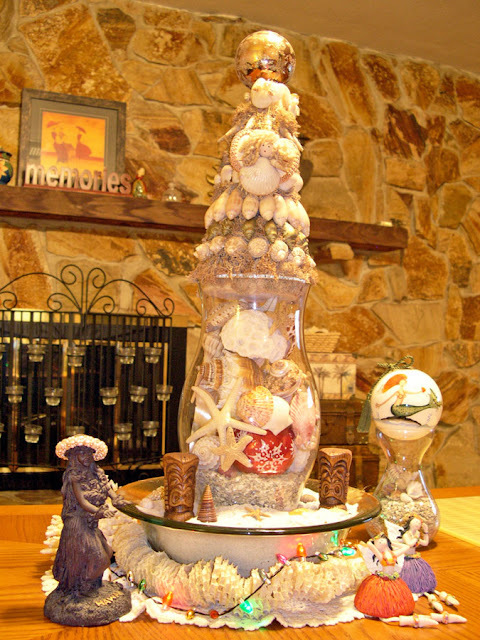 Love the shell tree and all the other fun decorations. I think it's fun to do some decorating that's related to our passions! Love the beach too; especially yearn in these 18 degree days! That tree is awesome...love the shirts! How creative. I LOVE them! What fabulous creations! 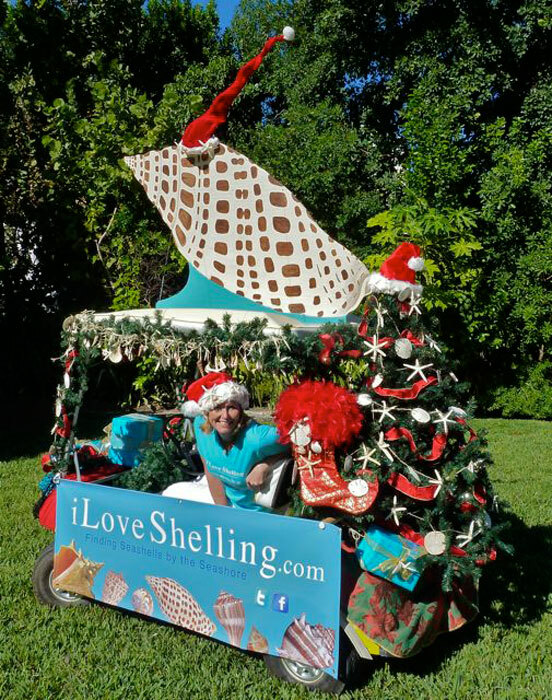 Your shell tree is FABULOUS- How cool! 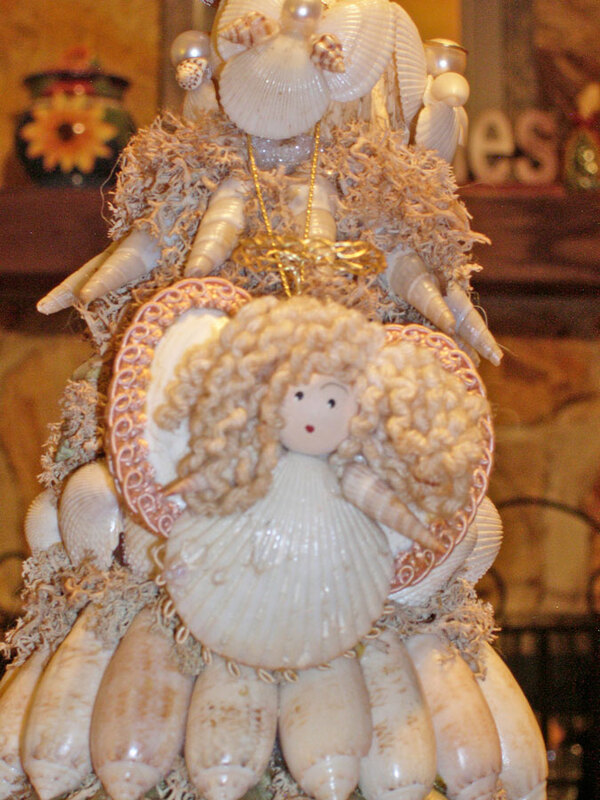 Love your little angel with auger arms. 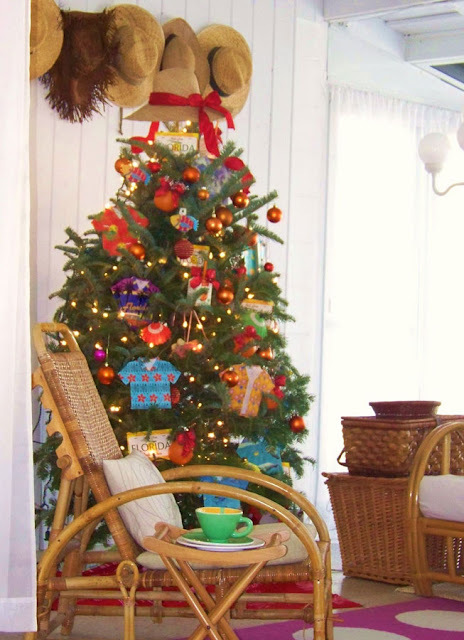 Becky's tree is so old Florida, you can just smell the beach- so sweet. Talk about sweet..... I'm so honored that you talked about my crazy junonia golf cart and stuff. You ARE the sweetest. 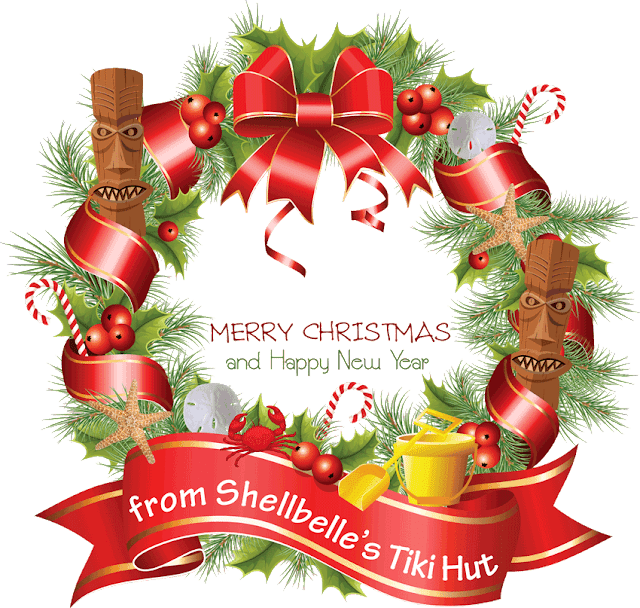 I remember when I first saw the pics of your tiki tree. 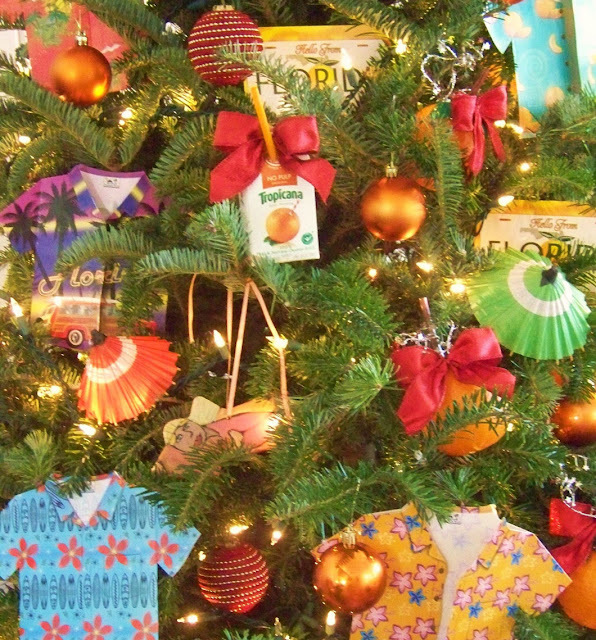 I just couldn't get over all the different things you incorporated into one bee-you-tee-full tree. I'm so glad you finally shared it again. I am going bananas...I love it all! 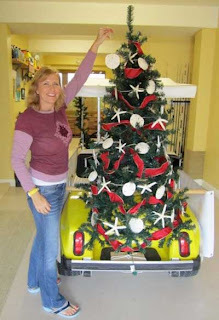 Love the tree and LOVE the yellow striped bag! Such a happy, colorful post, Rhonda. 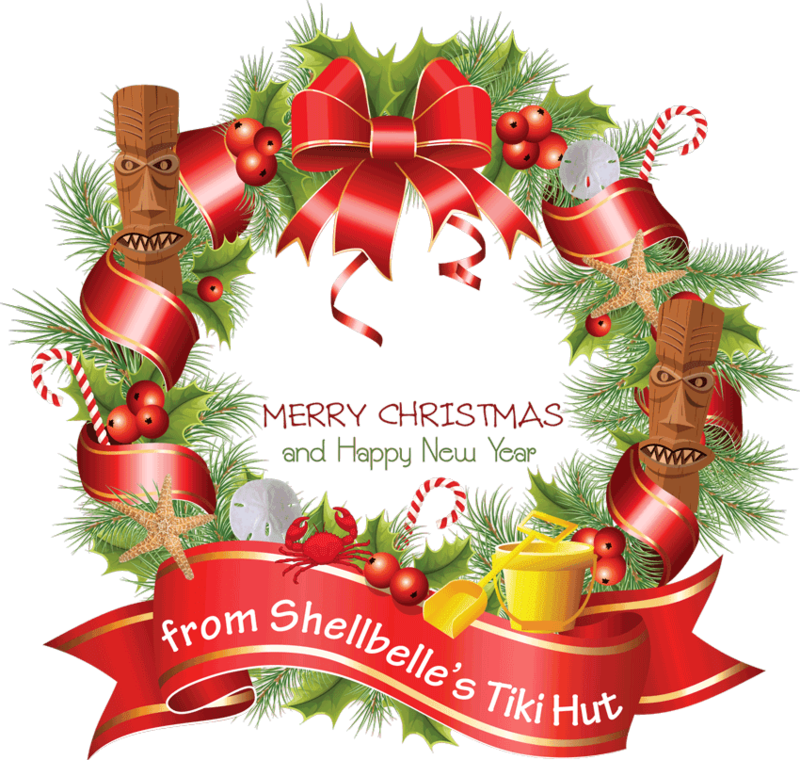 Did your son make the small tikis in your shell tree arrangement? They're adorable! Florida is great for Christmas!!! 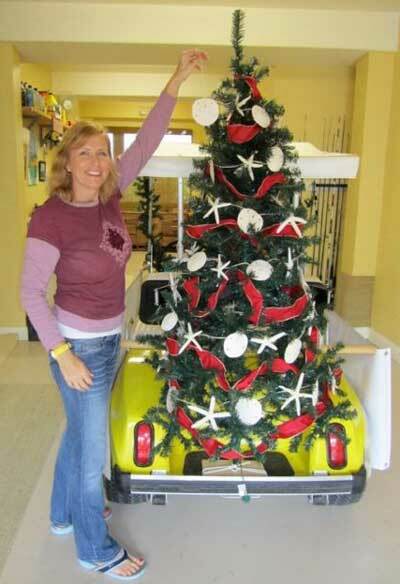 Oh how fun it would be to do a tree all wild and crazy Florida like that! Why didn't I do that when I put up several trees? Now I just have the one "pretty" one. I love the wreath "card" at the top of your blog...how did you do that? I love your seashell tree...as well as the other Florida trees. Such creativity! How are things working out for you in your new home? Wonderfully I hope. Sure hope you and yours have a wonderful Christmas. I love your tree. So creative and so cute!!! 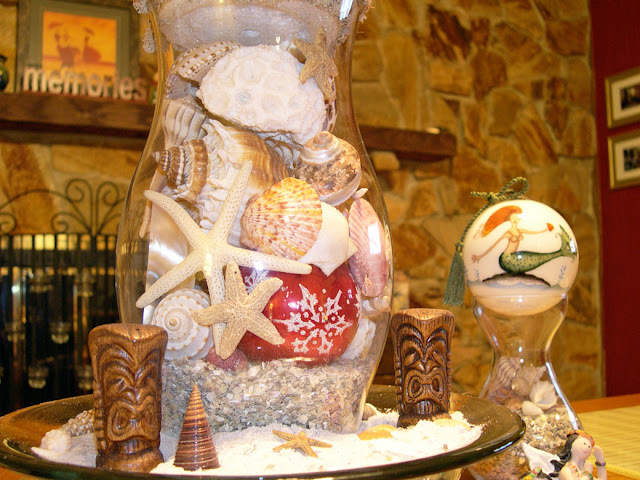 Very festive in a seashell kind of way. Which of course, I LOVE.